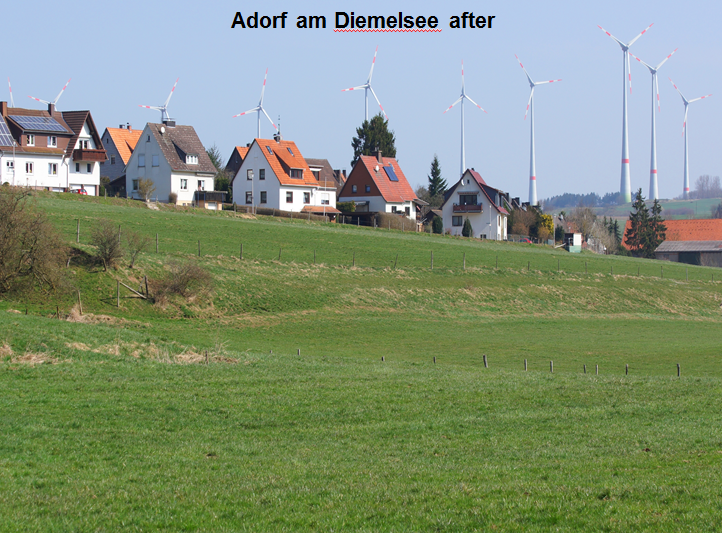 Shocking Before-And-After Photos: How Wind Parks Are Devastating Idyllic German Countryside! 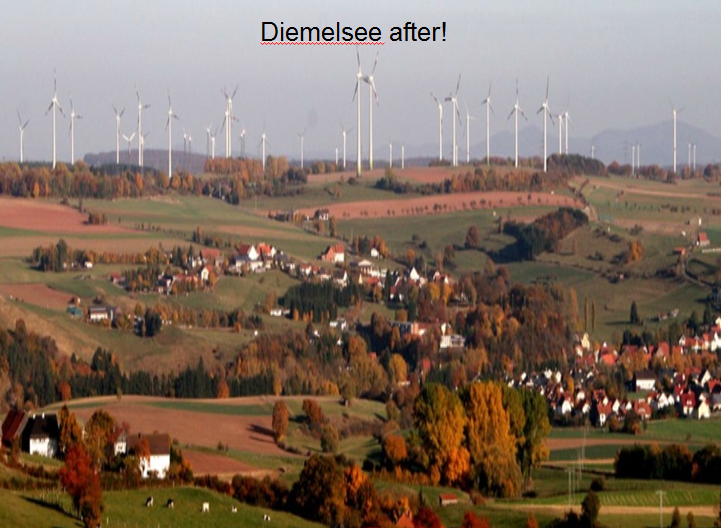 Browse: Home / 2015 / June / 02 / Shocking Before-And-After Photos: How Wind Parks Are Devastating Idyllic German Countryside! 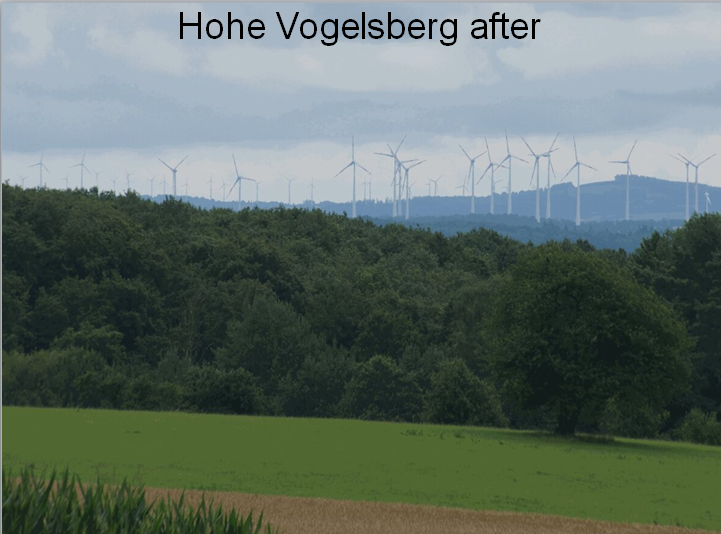 Note: Most, if not all, of the “before” photos were produced by airbrushing away the wind turbines from the real “after” photos, as some readers have pointed out. 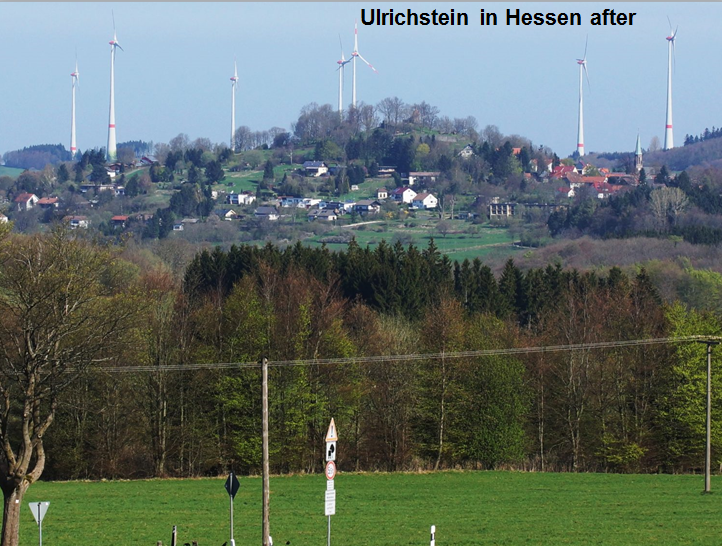 This is the most effective way of accurately showing the real extent the turbines have blighted the landscape. Wind energy is supposed to rescue the planet from an environmental and nature disaster. Unfortunately for many in Germany the opposite is true. It has brought on environmental ruin and destruction of natural heritage. 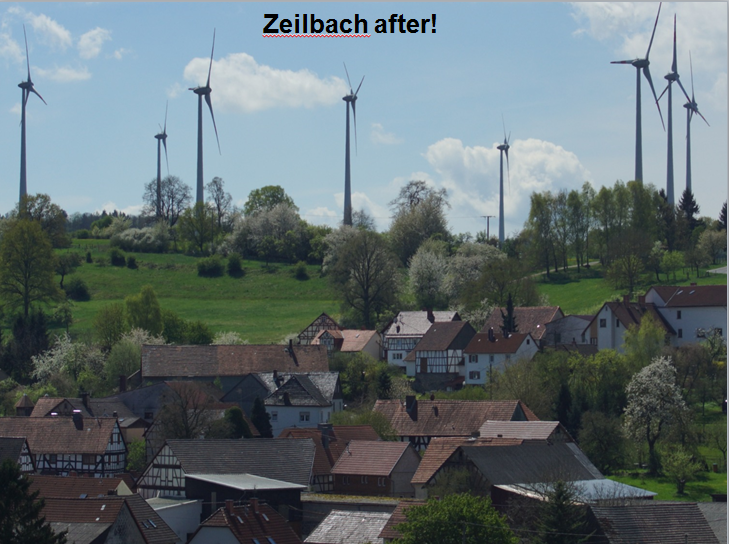 What follows are a series of before and after photos depicting the “success” wind turbines are having in rescuing the environment. 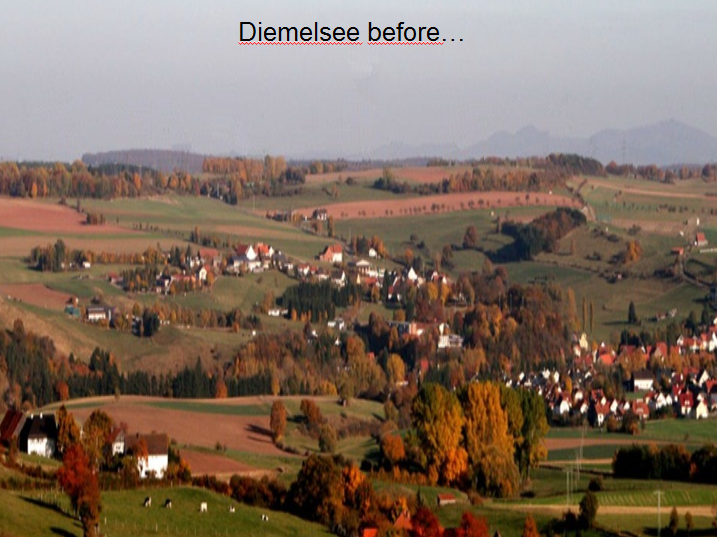 The photos are posted with the kind permission of Hermann Dirr of windflut-elpe.de. 11. Ostfriesland… 12. 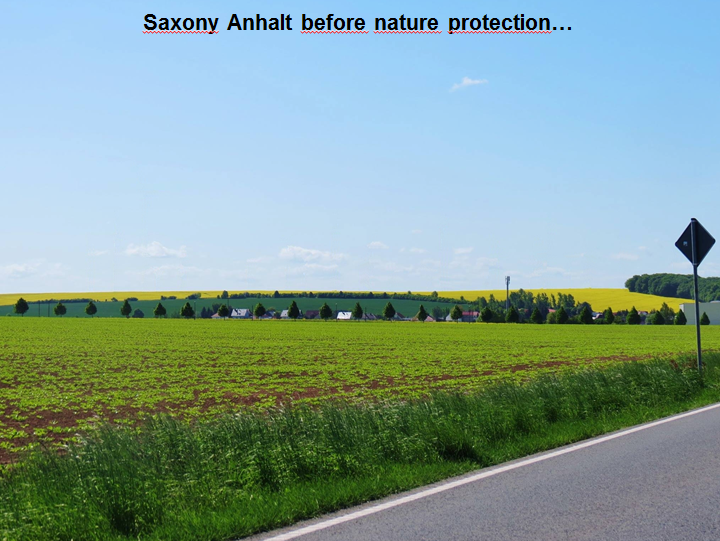 Saxony Anhalt: These are just some examples how Germany’s political leaders are protecting the environment. Aren’t they wonderful! Boy, we sure could learn a lot from these deep thinkers. Let’s not talk about the impacts on property values and the health effects from infrasound. 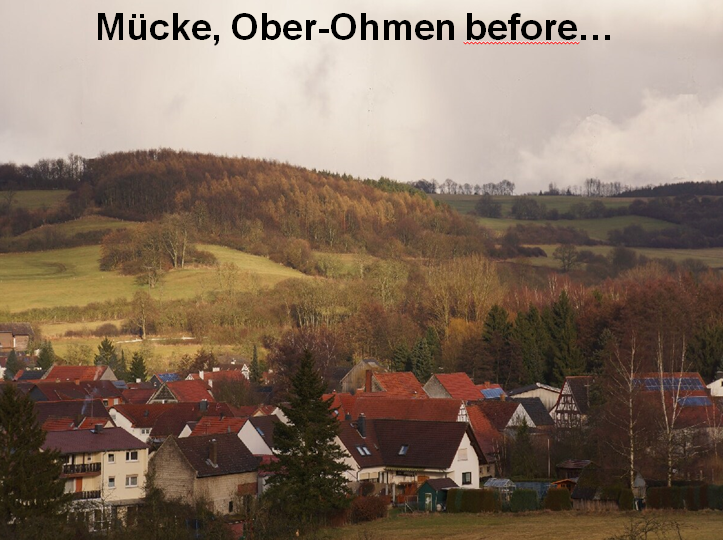 The original German Powerpoint presentation with the photos is here. Once again special thanks to windflut-elpe.de and the Naturpark Hoher Vogelsberg. This is appalling. The German government have no care for nature, the environment, and certainly no care for its people. My heart goes out to the people who have had these monstrosities imposed upon them. Is that an additional reason why the German government was so touchy about Google Streetview? Yes agreed Andy, I’m hoping they have taken the photo’s of the turbines and then removed the turbines with Photoshop and not the other way round. Picture No 11 shows they have been photoshopped. You can just make out the images of the turbines in the ‘before’ picture. It seems at least three have not been removed. Yes, I thought the same. 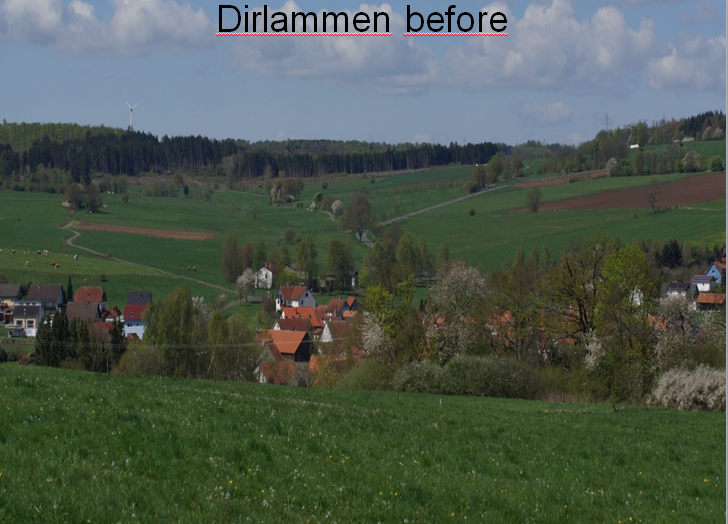 I think they have taken a photo of a particular windfarm as it currently is, then edited the photo to remove all the turbines to show how it was ‘before’. While the technique may be justified, the way it is portrayed is not honest, imo, and therefore detracts from the message. 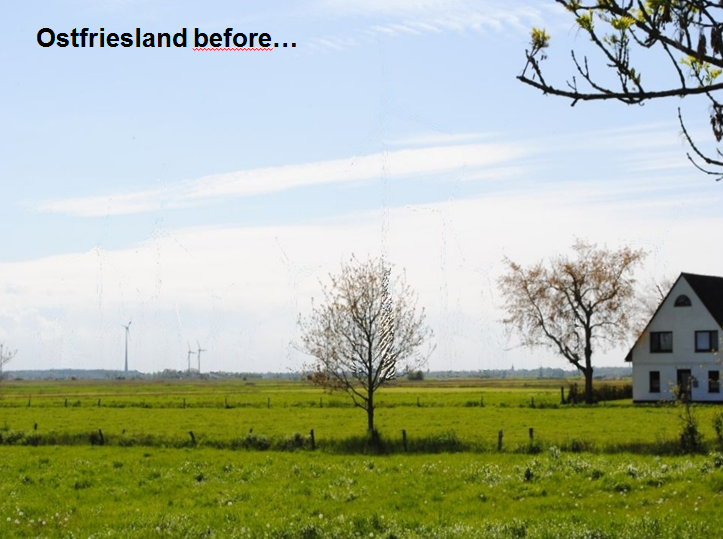 They took present photos and erased the windmills to show what it looked like before. Big deal! The reality is that the windmills themselves cannot be removed and that people near them have to live with them. The only reason I brought it up Pierre was that the people who agree with turbines will call the photographs fake. Yep.. they are photoshopped to REMOVE the wind turdines. I just didn’t think anyone could possibly build those monstrosities so close to houses. My mind only registered that they had been photo’d IN. How did they get away with building so close to houses ?? In France it’s 500 m. A local maire told be he was proud to be having one in the field next to his house. I wished him good luck. Unfortunatly it is NOT photoshoped! 🙁 Meanwhile there are people (included me) who think ’em back in the communist part of Germany during the cold war: You may only say, think and do what the gouvernment want… If you don’t they call you a Nazi!!! No joke!!!!! 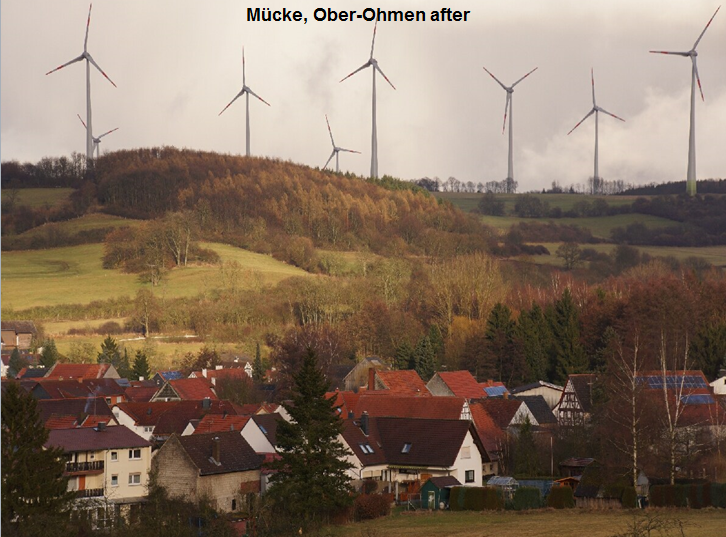 The pictures with the turbines are not photoshoped, however the pictures without the turbines are photoshoped. 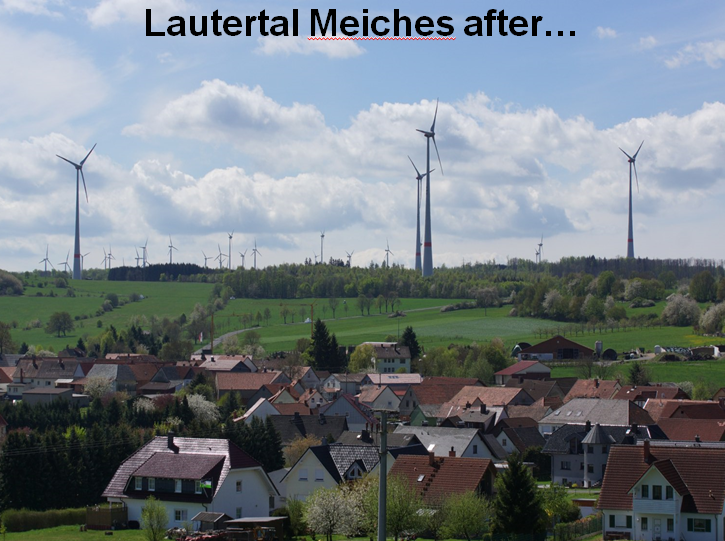 Someone has taken a lot of time to remove the turbines, and the reason you can tell the images have been photoshoped, is look at the clouds. 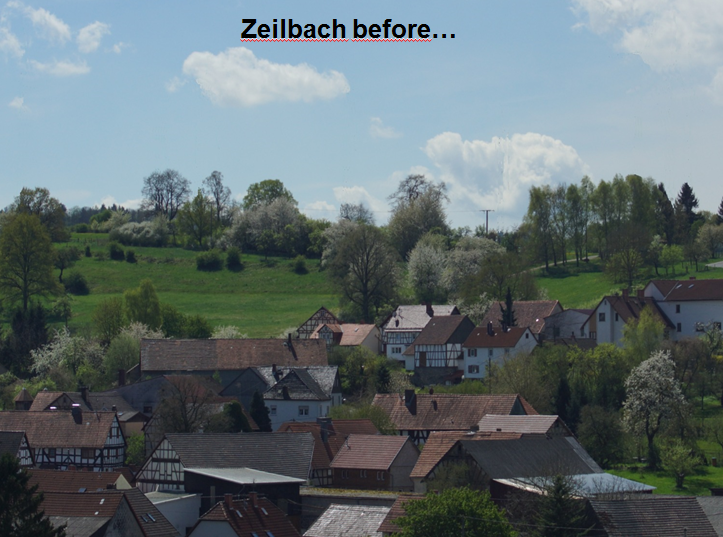 The chances of taking the same picture months apart with the same cloud cover is near to zero. Absolutely shocking what they have done to the communities. I hope one day there will be many lawsuits against the developers and Government. So many renewable energy zealots in the USA point to Denmark (with the highest electricity cost of the developed countries) and Germany with so great build out of wind sites as the example to follow. Oh, REALLY??!!! These photos show the travesty of building behemoth ugly noisy out of scale wind machines anywhere! If people had seen those pictures before allowing this desecration, it would never have been allowed. Even now, the operators must live a long way from some of those locations for fear of the people with pitchforks, torches and hempen ropes with nooses. A useful illustration of some of the harm to the environment caused by the success of CO2 Fright as a political vehicle in Germany. I daresay the cost of removing these foolish abominations will be met one day by the nearby communities, some time after the operating companies find that financial bankruptcy is a smart choice. They are already morally bankrupt in my view, and so it will not cause them much pain to abandon their machines when the time comes. What struck me was the relative height of the support columns. They seem to be nearly twice as tall (compared to the blade diameter) of most other windfarms. I LIVE IN TEXAS. WE HAVE SOME LARGE WIND FARMS HERE, BUT NONE (THAT I KNOW OF) THAT ARE IN CLOSE PROXIMITY TO POPULATED AREAS. WHEN I DRIVE THROUGH THESE WIND FARMS, THE NOISE IS ASTOUNDING. I CANNOT IMAGINE HAVING TO LIVE AS CLOSE TO A WINDFARM AS SHOWN IN THESE PHOTOGRAPHS. 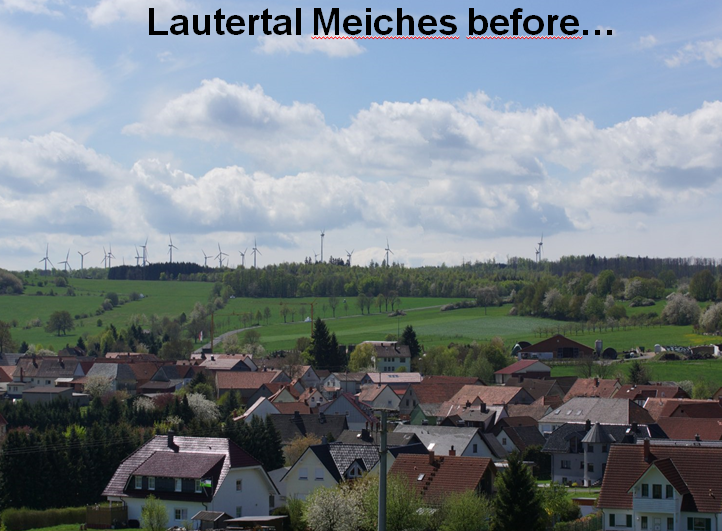 IT APPEARS THAT THESE PHOTOGRAPHS HAVE BEEN PHOTOSHOPPED, WITH THE “BEFORE” PHOTOGRAPHS HAVING THE WIND GENERATORS REMOVED. BUT HOW CAN THIS BE INDEPENDLY VERIFIED? 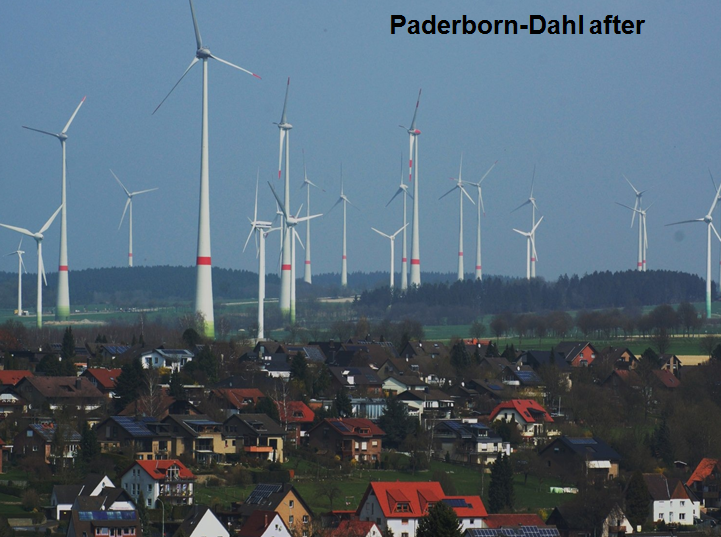 FOR EXAMPLE, I GOOGLED PADERBORN-DAHL AND FOUND SEVERAL WIND FARMS NEARBY, BUT NONE THAT ARE IN SUCH CLOSE PROXIMITY TO HOUSES AS SHOWN IN THE PHOTOGRAPHS OF PADEERBORN-DAHL. IT WOULD BE VERY HELPFUL IF A BETTER DESCRIPTION OF THESE LOCATIONS IS INCLUDED SO SOMEONE COULD INDEPENTLY VERIFY THE VERACITY OF THE PRESENTATION. PLEASE PROVIDE A MORE IDENTIFIABLE LOCATION FOR SOME OR ALL OF THESE PHOTOGRAPHS SO THEY CAN BE INDEPENDLY VERIFIED. PLEASE PROVIDE THIS DATA SO THE PHOTOGRAPHS CAN BE INDEPENDENTLY VERIFIED……. Agreed.. We should be more open and information rich than those committing the climate fraud. 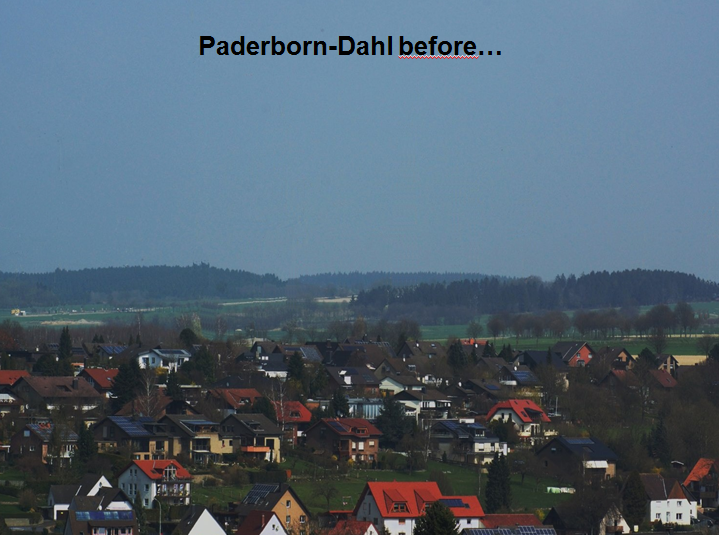 Here is analysis of the Paderborn Dahl photo, with other photos of the Windpark. The impression comes about through use of a zoom. The wind turbines are there, the photo is real, if you find the use of a zoom , shall we say, dishonest, I guess you have to discard half of all news reporting. Lee, I live in Wyoming County in western New York State. The wind industry (with the assistance of complicit, energy-illiterate crony-politicians who are only interested in lining their own pockets) are siting these giant signs of ignorance and greed here in New York State (and elsewhere) only hundreds of feet from peoples’ homes (600 – 700 feet from property lines and roads, and only 1100 – 1300 feet from homes). The pictures shown in this article accurately depict what these monstrosities do to rural countrysides where people live. Any state that mandates “renewables” (Renewable Portfolio Standard – RPS) like New York State does, is targeted by industrial wind developers. The people who end up in the way are told they must sacrifice their quality of life, and home and property values, on the altar of ‘green’ ($$$) energy to help stop “Climate Change.” They are having their properties virtually stolen from them in the name of the lies being told by Big Wind developers. One developer here got caught using old Bethlehem Steel brownfield slag as fill in their access roads – right amongst croplands. If you haven’t seen the documentary, “WINDFALL,” it is definitely worth watching. It was filmed in rural New York State, and highlights the wind industry’s ongoing assault in more highly-populated rural areas across America. 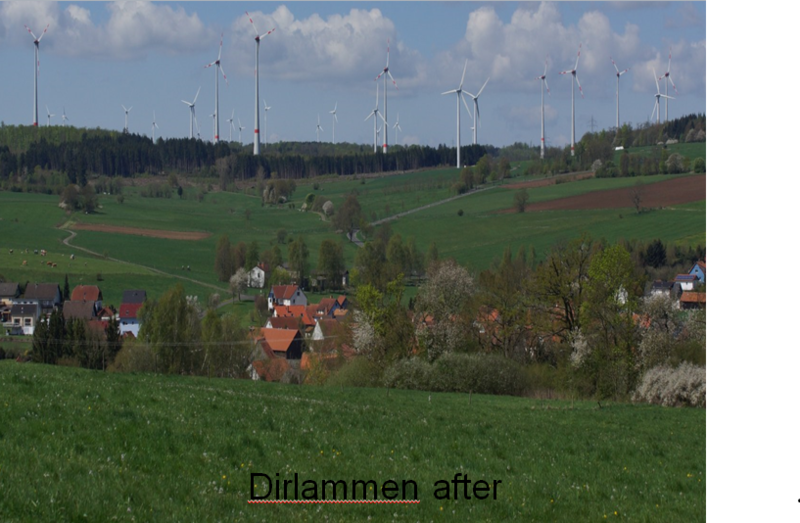 My problem with these images, is that it looks like nothing really Changed, save that more turbines appear. I was expecting to see acres of trees having vanished from one image to the next; mountain tops leveled; new roads ripped across farmlands. Instead, it looks more like they just walked in, stood them up, and walked away without so much as a blemish on the landscape (outside of the turbines themselves). I happen to drive a lot and sometimes I drive very near past 100 or 150 m high wind turbines behemoths. They are situated on hillsides, or on hilltops, surrounded by meadows, of course where there were forests those had to be cut around the construction site, otherwise how would you drive the heavy load trucks with the tower segments, the blades, and the cranes up there. 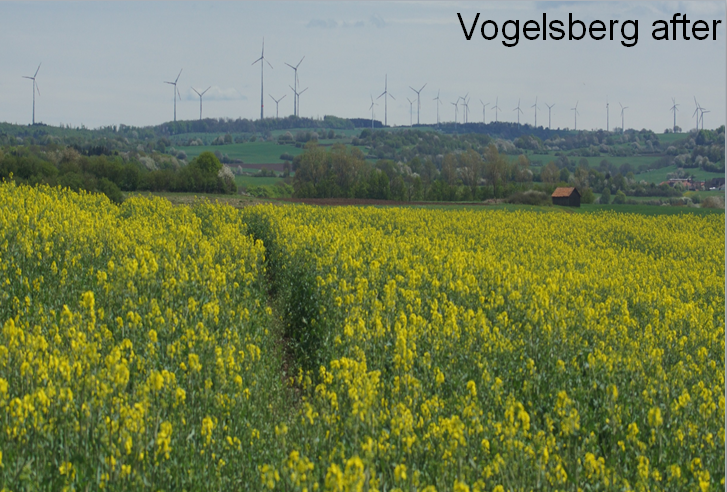 The vegetation regrows, you will stop trees from regrowing at least on one strip leading to the turbine because you need an accessway for a crane in case of repairs. The 900 tonne concrete foundation stays invisible underground. If 900 tonnes still do it for the latest behemoths. …so you can’t see those clearcut strips on those photos, when there are still trees left and right of it… Aerial photos would be needed to show more of the damage. 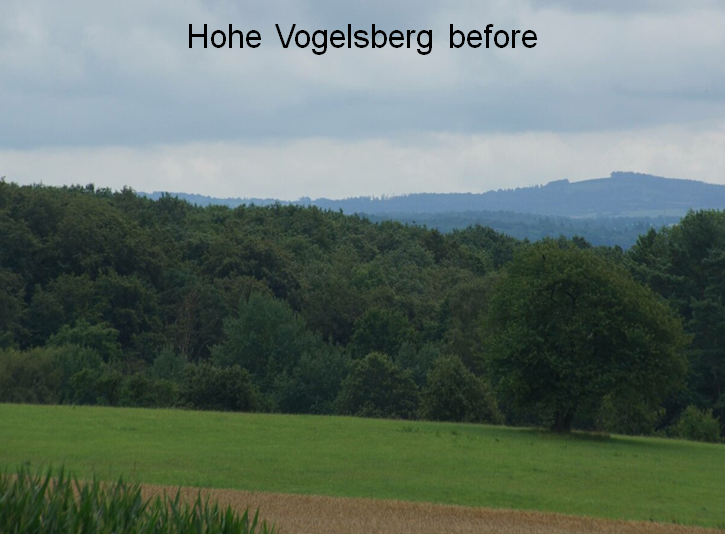 Well I don’t consider a few cut trees that dramatic; 99% of German surface are cultivated anyway, not wildland. Nearly all of the forest area is managed, the wood harvested anyway, though these days it’s a very natural looking boreal forest in most places. Not clearcutting it but taking out single trees as needed. shhhh.. don’t tell the guys at Drax in the UK !! For illustrative purposes cloning out turbines and using zoom to more closely approximate the human eye seems simply a practical way to give a good idea of what is monumental visual impact to those who have loved an area. Wide angle shots from the air still somewhat reduce the shocking scale of habitat destruction destruction and how heart-rending it is to live through the rapine of wild lands or a forest/wetland ecosystem. The run off, water-taking, and canopy reduction, change the hydrology of an area. Forestry roads in Northern Ontario are typically small, and tend to follow the terrain, respecting water bodies and regrowth generally commences immediately. Wind developments pretend to use those roads but blast off high ground and fill low areas to straighten and construct permanent highways which are huge festering wounds. Above it all there loom monuments to greed and gullibility or as one woman testified at an Environmental Review Tribunal hearing, “Symbols of Oppression”. Many of these photos are clearly photoshopped — they have the exact same clouds. 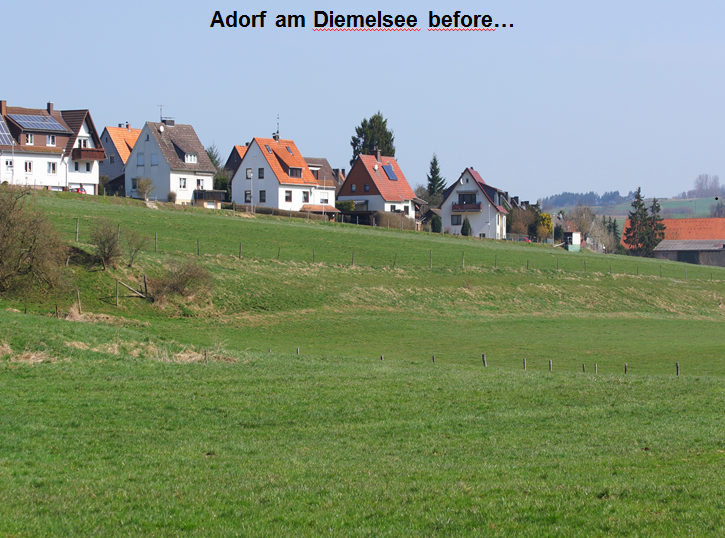 Dirlammen, Lautertal Meiches, Mucke, Zeilbach, Ostfriesland, Saxony. How else is one supposed to create an identical “before” photo? Or do you mean to say that the windmills were added, and do not really exist? For the before pictures, maybe you could have photoshopped in some coal-fired power plants, smoggy skies and acid rain? You mean like in North Korea, where they don’t need to airbrush out their illuminated nighttime cities, or the poorest African countries without electricity where life expectancy is under 40 and infant mortality is sky-high. Most of us in industrialized countries today were brought up on coal, gas and oil – and we’re living longer and richer than ever before. What’s killing people today is the high-carb, low-fat diets, which BTW were CONSENSUS SCIENCE for 40 years. Sorry David, but I really do feel you are a hopeless, unteachable moron when it comes to science. Coal at its real price is really expensive. Then heat your home with wind energy. Good luck. That power station is going to add a process to first convert lignite to a synthetic gas… what a seriously stupid thing to do. No wonder it costs so much… its a hand shake, below the waste, to the green agenda. 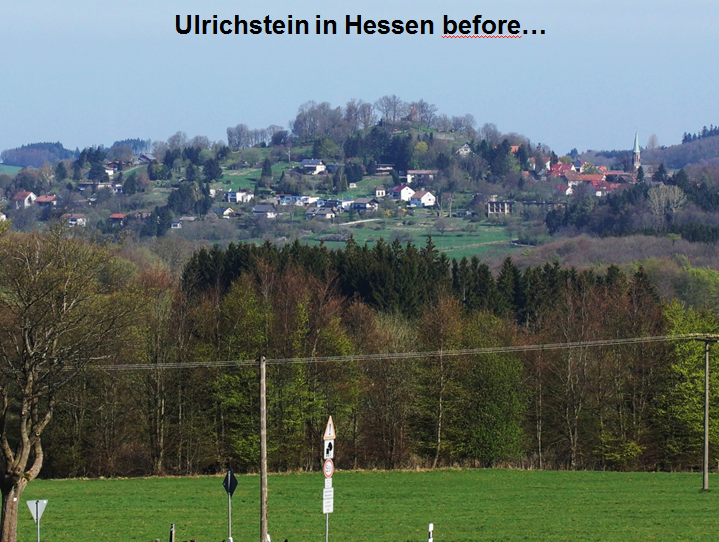 I mean, WHY BOTHER … just burn the lignite and save heaps while releasing life-giving CO2. Note , that again we see SOD choosing to display something as what it is not. You are a deceitful LIAR, sod ! Yes, David’s right for once. You should definitely photoshop some coal-fired plants too, to remind people of where the bulk of the electricity came from to manufacture the turbines and where the bulk of the electricity comes from to provide 100% backup power for these bird slicers during the hours, days or weeks when they are not turning. To the crazy greens: while ‘saving’ the climate, you lunatics ruined the planet. The pictures of wind farms bring to mind The War of the Worlds – both the novel and the 50’s movie. Somehow that seems like an apposite connection. A colorful person to say the least, I skipped the part where he became lobbyist for VW, I wouldn’t trust him with anything, not for a second. 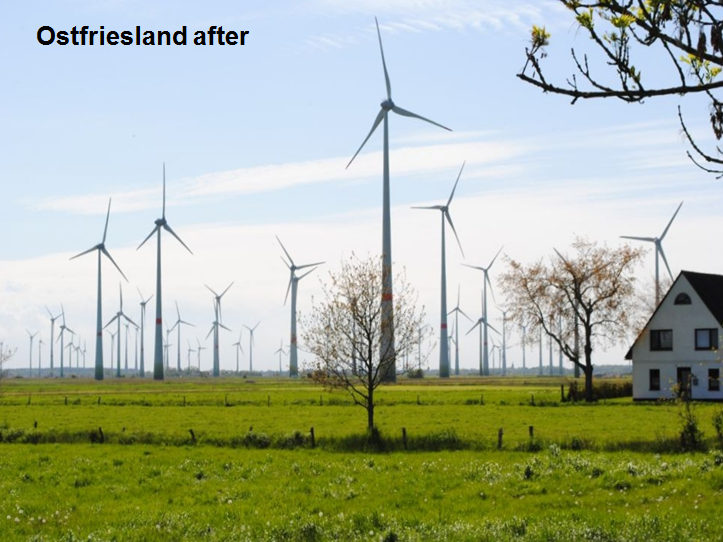 The before and after pictures are very powerful but they do not convey the insufferable debilitating noise that is generated by the useless wind turbines nor do they show the carcases of birds & bats scattered for 100s of meters around these monstrosities. Lee, I live in Wyoming County in western New York State. They are siting these giant signs of ignorance and greed here in New York State only hundreds of feet from peoples’ homes (600 – 700 feet from property lines and roads, and only 1100 – 1300 feet from homes). Any state that mandates “renewables” (Renewable Portfolio Standard – RPS) like New York State does, is targeted by industrial wind developers. 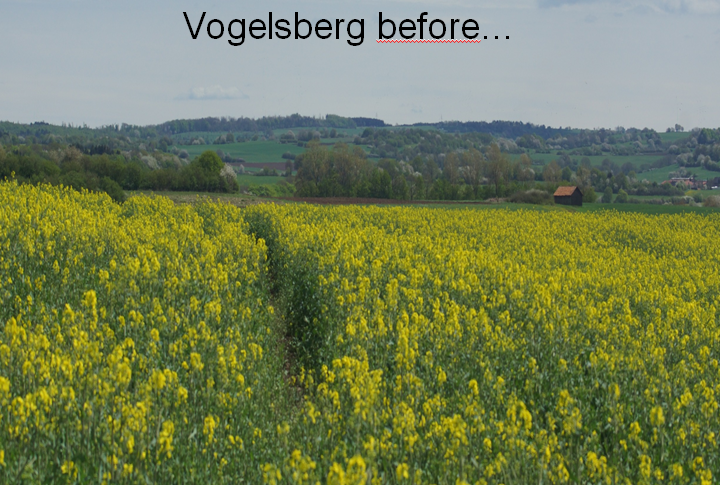 One developer here got caught using old Bethlehem brownfield slag as fill in the access roads – right amongst croplands. Lawsuits are ongoing. People who end up stuck living within the footprints of these industrial wind factories are having their quality of life and property values stolen from them in the name of the “clean, green” lies being perpetuated by the wind industry and their proponents.